HighEdWeb 2009 will be held at the Hilton Milwaukee City Center in Milwaukee, Wisconsin. With over 600,000 residents, Milwaukee provides the resources of a large city with the feel of a small, friendly community. Conference sessions will be held in over 30,000 square feet of beautifully-appointed meeting space. Combining its 1920's grandeur and elegance with today's modern conveniences, the Hilton includes three lavish ballrooms and numerous meetings rooms. 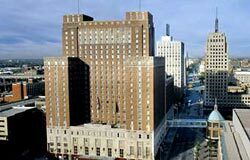 Located in the heart of downtown Milwaukee, the Hilton Milwaukee City Center is within walking distance of restaurants, museums, parks, Lake Michigan, and public transportation. The conference hotel is the Hilton Milwaukee City Center. All rooms include complimentary internet access for HighEdWeb attendees. Hotel guests are welcome to park in the secure and covered parking garage adjacent to the hotel for $24/day. Additional surface parking and parking garages are available nearby. Catch a taxi or van service outside the Milwaukee airport's main terminal; the average taxi fare from the airport to downtown is $21 one way. Book a reservation with Airport Connection, which provides door-to-door transportation services from Milwaukee or Chicago airports at a discounted roundtrip rate of $22 for HighEdWeb attendees. Get a 5% discount on Enterprise car rentals. Located in the heart of the Upper Midwest and just 80 miles north of Chicago, Milwaukee is easily accessible. Milwaukee's General Mitchell International Airport offers non-stop jet service to over 40 cities and connections worldwide through several airlines. Just 80 miles south of Milwaukee, O'Hare International Airport also provides flexible and cost effective flight options. Milwaukee is conveniently located off of Interstates 94 and 43 and is within a day's drive to over one-third of the United States. Driving distance from Chicago is 80 miles, from Cincinnati is 384 miles, from St. Louis is 375 miles, and from Des Moines is 370 miles. A regular stop for Amtrak, Milwuakee offers daily departures to Chicago and Milwaukee. See routes.